One of the best parts about working at a bead store is meeting our local artists! Bellingham is rich with creative bead makers, and Judy of Weasel Glass is no exception. Judy is a talented glass artist whose work includes handmade lampwork beads and fused-glass pendants; Weasel Glass also features finished jewelry pieces made by Judy and her sister Lynn. Judy is a successful entrepreneur, and can regularly be found selling her work at the Bellingham Farmer’s Market. Weasel Glass’s finished jewelry is also sold at Good Earth Pottery. Bead Bazaar is happy to announce that we’re currently selling Weasel Glass beads and pendants for the Summer Solstice Art Walk, an annual event which celebrates the work of local artists. Come wander Fairhaven, enjoy refreshments and admire local art at each participating store. This year’s Art Walk takes place on June 20th, from 5:00-8:00 pm. Weasel Glass beads and pendants will be available in store now through the end of June. Q. What materials do you like to work with? A. Glass of course, particularly dichroic glass. Frit, precious metal leaf, and latticino that I have made myself. 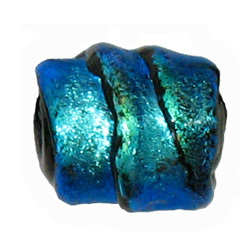 Semi-precious stone beads. I love color and texture. Q. What techniques do you use? A. My beads are made using a “wound” technique, rather than being blown. I layer, pull, shape, and add silver or gold leaf, frits, my own handmade latticino. Possibilities are endless. Q. How long have you been making beads? Q. How did your business get started? A. In the 80’s I started collecting contemporary art glass. 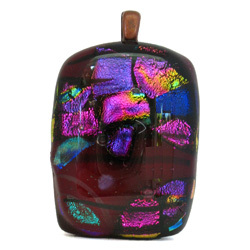 At one point I heard of a one-on-one bead making class offered my Michael Barley, and although I had never thought of actually working with glass myself, I realized it was an obvious progression of my love of glass and an incredible opportunity. I was hooked. My business followed. Not wanting to be too serious, I named it Weasel Glass. My sister, Lynn, soon joined me. A. Loose. I usually don’t choose to be precise, I like irregularity and things that don’t quite match. I like to make people laugh, and often that is reflected in my work. A. Nature, people, events. Sometimes I make beads for specific people to commemorate an achievement or event, or just to make them smile or laugh. Q. Has anyone been an influence to your work? A. My sister, Lynn, who is a jewelry designer. Her sense of color and form is awe inspiring. And Tamar Groffman, for whom I make crazy, humorous bead heads and props to go with her whimsical sculptures. Q. What other hobbies or activities do you enjoy? A. I like yard work and growing dahlias. My volunteer work at the Whatcom Humane Society, where I walk dogs, “wrangle” animals for the photographer, and assist in the vet clinic, enriches my life in so many ways. Q. Do you have any hopes or ambitions for your business in the future? A. I’d like Weasel Glass to continue to grow in sales and offerings, and to have continued success at the Bellingham Farmer’s Market. Work that evolves with time is critical.